The only battery listed in the May 1965 parts book as a Cobra race part was an aircraft one made by ReBat®. Totally unrelated, but an original tie down bracket for that Rebat pair just sold on eBay for like less than a dollar. The battery for a competition 289 Cobra was the same size if not type as the production street 289 Cobras. I’ll have to go through my notes to make sure. I would think the battery size and post configuration from a 1964 Fairlane would be correct. Last edited by CompClassics; 07-25-2018 at 03:19 PM.. Early Cobras used Lucas® batteries. CSX2117 first chassis by invoice to drop by contract the AC Cars supplied battery, generator, tachometer drive for generator, and tachometer. Posts orientation for street cars is opposite that of a Mustang and no one makes look-a-like 1963-64 Autolite® batteries with "reverse" posts Cobras would require that I know of. The only new car road test showing much of the battery show what appears to be an Autolite 24C type battery with white text on the short vent caps. I believe that it was a generic service battery not used in any other new car. I have talked with original car owners that have hunted for decades and not found a match. I have been using Motorcraft® BXT-24 models in our Cobras for a long time. They are hard to install or remove because they are physically larger than the original battery. Last edited by Dan Case; 07-25-2018 at 06:28 PM.. 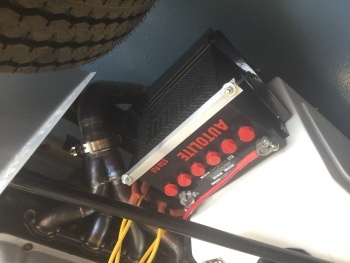 There is a company making "Autolite" batteries (red screw on caps) that have the appearance of the originals but are maintenance free. I will have to look at the available post orientations that they offer to see if one matches up, I seem to recall a group 24 battery for some reason. I used such maintenance free battery to replace my red Optima. I'm not sure about the quality of the current reproduction batteries, but a few years back they were known to be quite unreliable. A good option is to buy just the top Autolite cover for about $40. Or you could hunt the wrecking yards or battery recycle yards for the period correct old battery. Then do what I did. Cut the bottom and back out of the old battery. Gut it of the cells (the acid would have had to be drained and the battery flushed/neutralized first). Detail the battery case. Get the correct battery caps (if it doesn't have them) which are available on the aftermarket. Then the old Autolite StaFul battery case slips right over a modern Optima battery. Full marks for looking for a battery that looks original, but shouldn't a battery be regarded as a consumable, just like tyres? How many replica Cobras are out there wearing crossply tyres? I thought I'd put a charge into this battery thread. My car currently has a group 42 which just fits and does the job (plenty of CCA). However, its height precludes using the stock Shelby supplied hold-down. I know I can use tubular spacers to accommodate the 42's low height but that's not the look I'm shooting for. 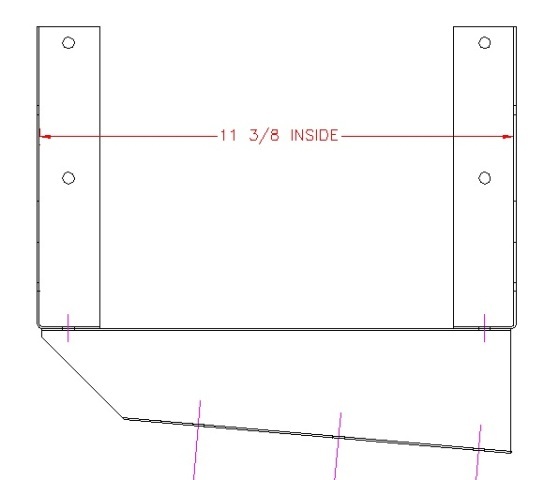 Shelby's stock battery box is 10 inches long so no group 24 will fit. However, I'm thinking a group 22F might be my best choice and may have been Shelby's choice back in the day. As a teen, I didn't flip burgers during the summer, I worked at Gould Battery in City of Industry, CA. I loaded thousands of batteries on the shipping line where they were cleaned, painted, boxed and loaded on semi's. There were a lot of Autolites and Delcos as well as service station brands. I loaded many many 24's, 24F's, and 22F's. The 24's are still popular; the 22F not so much. But they seem to be available if you're looking for a lawn/garden battery application. Compared to a 24F, the 22F is significantly shorter (9.5 inches), about the same width, maybe a half inch lower. Size matters. Especially for my car. I've got the "Daytona coupe" style backbone chassis which restricts access to the battery box. So, based on my experience with wrestling ANY size battery into position, I'm looking for a high CCA 22F battery. Antique Auto Battery is/was offering a battery that should work with the correct look. If I recall correctly, they were even offering a Lucas lookalike with Optima internals. Dan, could you clarify "reverse" post batteries (the ones that Cobras require). In the case of group 24 batteries, is it the 24F that has reverse posts? At Gould IIRC it was either "Ford" style 24F or standard group 24. But confusing the issue at the time was the fact that some GM cars used "F" post batteries! I’ll try. Understand my frame of reference is from mostly 1965-70 Mustangs (standard, Boss, and Shelby versions) and original CSX2201 and later Cobras. I am going to back up a few moments. Disclaimer, details are in regards to original CSX2201 and later roadster chassis. From an earlier post, "Posts orientation for street cars is opposite that of a Mustang" Ford car wise people hunt for original fitments for 1965-70 Mustangs more than anything else I know of. Over the decades quite a few people have posted batteries with positive and negative posts placed like 1965-70 Mustangs for sale to the original CSX2201 and later Cobra owners market not realizing original equipment positive battery cables weren’t sized length wise or installed location wise to go to a battery like a Mustang had. The negative cable could have its chassis mount location changed to reach. AC Cars Ltd supplied the battery mounting bracket and the piece of British specification marine plywood that fit inside the bottom (same plywood used as a gap filler between upper and middle fire wall panels at their overlap joint). The holder was nominally 11-3/8” wide inside side to side. Functional width was a little less because the Cobra unique J-bolts for the top channel clamp fit on the inside the holder’s side walls. Not shown in the sketch below is the deformation required for the hole in the side wall on the engine side that the holding clamp j-bolt on that side must hook into. As drawn it is for CSX2xxx chassis with battery ahead of the right side footbox. Deforming the hole opening is required because the battery heat shield assembly is attached to the engine side wall of the bracket. The deformation must be pronounced enough for the bolt hook to fit in. As I have only used Ford brand service batteries I cannot comment on any other brand. We have gotten as many as 14 years service out of each Ford battery (any car or light truck). Ford offers "24" sized batteries. To them everything they have sold over the counter for a particular application since they bought Auto-Lite® in 1962 is for them is probably just that, the same application. From memory the Motorcraft® 24 sized battery of 1985 was pretty much just a rectangular box with caps and terminals in the top. What they sell now has an enlarged top (mostly long wise) that includes a large integral plastic carrying handle. I cannot tell you what the based base foot print has been all these years, I would imagine that the bases have conformed to some industry standards and tolerances or another. If one had unobstructed straight up and down access any of the ones we have used would have been no problem to install or remove. That is not the case in a CSX2201 and later Cobra which not only has the battery under the right wing but under the cockpit ventilation hose on that side, the starter cable, positive battery cable, and the starting solenoid the cables attach to it over the battery. The horn relay is also over the battery but it is smaller, mounted higher up, and further from the engine. No matter what battery you have to negotiate around the right side scuttle hoop support and unless you remove it the battery heat shield can be in the way depending how you try to rotate the battery in. Passage by the heat shield is close in any event. CSX2201 and later cars also have a horn installed on the right side scuttle hoop support between the alternator and battery heat shield and it too can be in the way depending on battery dimensions and how two work the batteries in and out. In such close quarters adding in effect a flange around the top of Ford brand batteries made them harder to get in or out. We put a current Ford battery in our red car too. It also required disconnecting the wires from and removing the starter solenoid allow the battery to wiggle by. I would have to agree with Tom, it may be worth checking into other manufacturers battery specifications to see if anything will come close. The other problem of course is the manufacturer type and the battery cap details. As far as I know, when it comes to automotive and truck batteries, it doesn't matter what the brand is, group size dimensions are, in effect, carved in stone. A 22F Delco is going to be dimensionally identical to a 22F Autolite. And the post positions are going to be identical. There has to be some standardization or there might be chaos simply trying to find a flashlight battery! Search for BCI Battery Group numbers. Jegs offers an easy to read chart which includes all the dimensions. Dan, if you're not too fussy about appearance, you can find a modern battery that does the job and will be a lot easier to install in your "daily driver". It sounds like, over the years, that basic group 24 battery that you installed easily in 1985 has grown while picking up "suffixes" that account for the size increase and commensurate difficulty. Dan, if you're not too fussy about appearance, you can find a modern battery that does the job and will be a lot easier to install in your "daily driver". It hasn't strictly been 'looks'. Having been in a Ford enthusiast family (three non-Ford cars or trucks since 1946) it has been more keeping a Ford all Ford if not real impractical. Our oldest Ford here is a 1930 Model A that was my father’s all time favorite car and the youngest a 2017 Mustang GT. If I am still around the next battery change something not so hard to squirm out and in will be used. At this point a battery change is at least ten years away so no need to worry about it now. I was a Ford enthusiast until I got mixed up with the 5.4 Triton POS. Cheers! Probably not relevant to you chaps, but the UK market cars were positive earth. US cars, I believe, were negative earth. A few CSX2xxx chassis were positive ground. Long ago the owner of CSX2186 figured that out the hard way. It may have just been the few cars AC Cars completed occassionally.